EBL Construction, a division of EBL Partners, an established construction and project management firm based in Naples, Florida, has been selected to provide construction management services for The Ranch Club swimming pool complex at Boot Ranch, a luxury golf course community located in Fredericksburg, Texas. The project consists of the addition of a pool clubhouse, a 6,000-square-foot, resort-style pool, tennis courts and pavilions. The complex is scheduled for completion this summer. Designed with every generation in mind, Boot Ranch offers a championship golf course and 55,000-square-foot Clubhouse Village surrounded by the great outdoors. The Clubhouse Village consists of six individual structures located on top of a 2,000-foot elevation bluff with magnificent views from every porch. Separate locker rooms, grills and lounges are proved for men and women as well as formal and informal dining venues. For the convenience of members, two members’ lodges are located in the Village. PGA legend Hal Sutton designed the Boot Ranch golf course to provide every player with a peak golf experience. Sutton took full advantage of the natural contours of the property and created a course that rises and falls along the natural ridges and valleys located within the community, including the natural water features such as the twin, 40-foot waterfall crashing down in front of the 10th green. 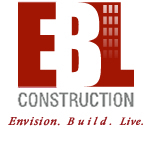 EBL Construction provides construction and residential renovation services for clients throughout Florida and across the country. The company’s experience profile includes the successful completion of projects in various sectors, including commercial, hospitality and residential. With a reputation for consistently meeting and exceeding the needs of their clients, EBL delivers unmatched build-out services and ensures the highest attention to detail at every stage of development. The firm is currently engaged in projects in New York, Florida, Texas and Georgia. EBL Construction is located at 1482 Rail Head Boulevard, in Naples. For more information, call 239-431-5003 or visit www.EBLConstruction.com.